Yeah, maybe a follow up post is in order concerning the White Ohio Vintage 10 month Parmesan. Call me curious. Gouda, you've written a wonderful intro, as usual. I think you offer White Artisanals the adulation they deserve, for being stewards of genuinity in our increasingly globalized market economy. I received the small sample of Parmigiano-Reggiano from White Farms very soon after the behind-the-scenes handshake was made. I am really happy that we included Charlie in the quest for cheese excellence. This was a very fine cheese. I let it sit out of the fridge for about an hour ot so, and then sampled it. Well done. It had a semi-tart, semi-sweet flavor like other good Parmigiano's I've had. The texture was a little harder than the Manchego we tried (see annals, 2006) but still brittle like the Manchego in some ways. I wish I had a larger piece, honestly, because the sample I had might have hardened a little more than Charlie might have liked to serve it. In all, it was a tasty cheese and I'm overjoyed that the quest for excellence has been extended to a dear friend. i have to echo ricotta's sentiment on the size of the sample. 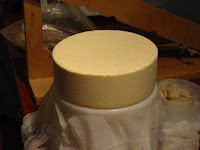 jenkins makes particular reference to slicing small samples from a large block to preserve the integrity of the cheese. and of course, there's the issue of scale here as well. most wheels of parm are around 50lbs, where charlie's was 5lb. so it's not as though he could have cut us a huge piece. thus is the price for small batch fromage production. charlie's parmesan was truly excellent: walking a fine line of saltiness. also, i have to say i've not often tasted parmesan NOT on a food before. so this was an interesting experience. i think there's a narrow minded view of parmesan in the u.s. as just something that comes in a green can, but really it's much more. i had this sample with some white wine and sliced apple. the accessories really brought out the piquant flavors, sort of earthy. salt of the earth, you might say. charlie: we salute you. outstanding. White wine and apple...that sounds like an excellent idea to augment the Parmigian. i will remember that next time....on a different note, since the Artisan White, cheesemonger-in-training and lover of fine things, lives so close to Ricotta's hideaway in Arlington, it behooves Gouda to come east at some point in the near future in order to make pilgrimmage to White Farms and share in the wheels, bottles, and other delicacies first-hand. I was equally impressed with Mr. White's excellent, authentic cheese. I was impressed with the speed of delivery, and I was impressed with the even, golden color that was revealed upon unwrapping the little gem. I have probably sampled more varieties of Parmesan than some other cheese, and what I appreciated most about this sample was it's complexity. It was not all about salt- this cheese had real flavour, and allowed the taster to experience a rich nuttiness that is not always present in very aged, commercial parmesans. I also lamented the sample size, and I think I did it a disservice by not leaving it out of the fridge long enough, but I just couldn't wait any longer. Fellow gastronomes who also happen to be housemates devoured the sample as soon as they learned of its origins.